Bella Hadid and The Weeknd did what many New Yorkers did begrudgingly: leave their warm apartment and subject themselves to the brutal 10-something degree weather, which felt like a lot less with the wind chill. The temperatures in New York have dipped way below freezing, thanks to the Polar Vortex. And Bella Hadid managed to freeze her hair on Friday, after she went out fresh from the shower. Bella showed off her dark hair with strands covered in light white ice as her first IG story of the day. It showed a close up shot of the locks that made it look like she had light grey streaks in her mane. “Warning: do not 6am shower. 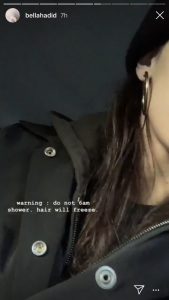 hair will freeze,” she captioned the pic, so hopefully some of her followers can learn a lesson. Fortunately ice melts so her locks probably weren’t too damaged. Luckily she soon thawed out, with boyfriend The Weeknd, 28, doing his best to warm up the 22-year-old model. Spotted leaving her New York City apartment together, Bella grinned happily before the pair hopped into a waiting car. Bella and The Weeknd both appeared to be matching during the errands run, stepping out in black ensembles head-to-toe. The Vogue model opted for a simple shirt that was tucked into her trackpants. She completed the look with an oversized jacket over the top and a pair of crisp white sneakers that could have been mistaken for snow. Bella accessorised with a large bag that had her name monogrammed onto the front, skipping any warm knitwear such as gloves or a beanie. The younger sister of Gigi Hadid styled her brunette tresses up into a high ponytail and appeared to be wearing only a minimal amount of makeup. Even if any of her natural hair did break off from the ice, by her next series of IG stories she was in a warm white bathrobe already in a makeup chair with a glam squad working on her. She showed herself getting long extensions put on and she ended up with a gorgeous high pony, the type that Ariana Grande has made so famous. Bella also had on full makeup and it appeared she was being prepped for a photo shoot. The Starboy singer was photographed wearing a very similar jacket and kept a low profile with a pair of shades. Bella’s appearance comes after it’s been reported that Weeknd is planning to propose to her any day now. Hadid and The Weeknd recently moved in together at the end of last year. At the end of October, the NY Post and TMZ both reported that the two were now sharing The Weeknd’s $60,000-a-month Tribeca condo in New York City shortly after he signed a lease for it. Multiple sources told TMZ that The Weeknd was the one to ask Hadid if she wanted to move in. She said yes. During the holidays, The Weeknd shared a photo of Hadid and their gigantic Christmas tree in their downtown Manhattan home. The Weeknd and Hadid‘s outing comes after they were photographed out together last weekend. Then, The Weeknd was playing the role of Hadid’s Instagram boyfriend. He was shot taking a photo of her on his phone.